Lev Manovich. Visualizing Vertov. 2013. [PDF 10 MB]. View high resolution versions of all visualizations discussed in the article on Flickr. Visualizing_Vertov.text_and_illustrations.zip 2013. [ZIP, 58 MB]. 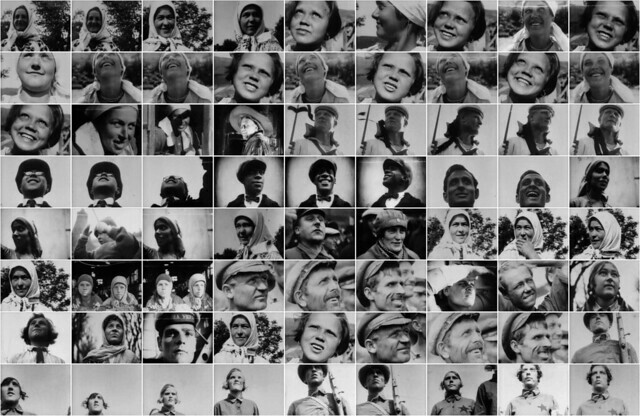 All shots with close-ups of faces from The Eleventh Year (Dziga Vertov, 1928). The shots are arranged in the order of their apperance in the film, left to right, top to bottom. The article presents visualization analysis of the films The Eleventh Year (1928) and Man with a Movie Camera (1929) by the famous Russian filmmaker Dziga Vertov. One of the goals of the project is to show how various dimensions of films can be explored using special visualization techniques inspired by media and new media art, as well as the basic principle of cinema itself - editing (i.e., selecting and arranging together media elements). This use of visualization without measurements, counting, or adding annotations is the crucial aspect of my lab’s approach for working with media collections. We hope that it can add to other approaches already used in quantitative film studies and digital humanities. The article presents a sequence of 33 visualizations which start from a “bird’s eye” view of the cultural artifacts (e.g., hundreds of 20th century films) and gradually zooms in closer and closer, eventually focusing on details of a single shot – similar to how Google Earth allows you to start with the Earth view and then zoom in and eventually enter a street view. The article is an experiment. It does not develop a single argument or a concept. Instead, I progressively “zoom” into cinema, exploring alternative ways to visualize film media at different levels, and noting interesting observations along the way. The digital copies of Vertov's films were provided by The Austrian Film Museum (Vienna) which has one of the best colllectoons of film prints and other Vertov materials. I am grateful to film researcher and Austrian Film Museum staff member Adelheid Heftberger for initiating and making possible this project in 2009, and providing detailed feedback on the work as it developed. The work of Software Studies Initiative on visualizing cinema, TV, animation, motion graphics and video games received grants from NEH, NSF, Mellon Foundation, Calit2 and UCSD. Special thanks go to Larry Smarr and Ramesh Rao at Calit2 who made our lab possible, and continuosly support our work since 2007.
this is a very interesting way to investigate films. i made something similar in a research about the war and atomic bomb in the japanesse anime movies. really interesting article about Vertov. Thank you a lot for making it available!